Far fetching mountains, calm rivers, steep green valleys and historic temples comprise the country of Bhutan. 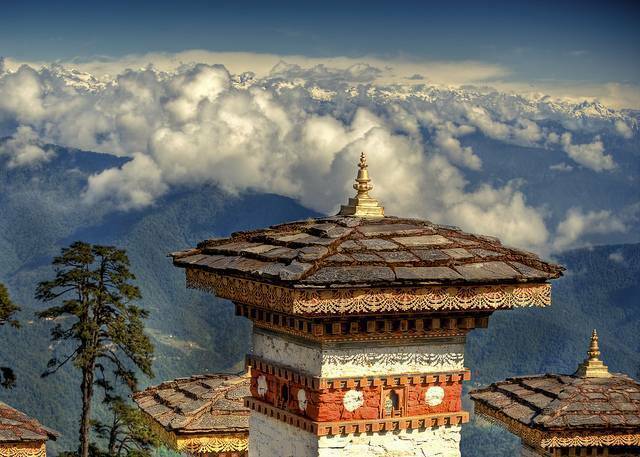 A typical example of Bhutan’s environment and culture is the Dochula Pass, a first high pass in the Western region, which apart from being a picturesque landmark facing Himalayan mountains, is also a religious attraction. Located at an altitude of 3150 metres above sea level, on the road leading to Punakha, it grants the traveller a 360 degree picture of the landscape. This pass, a 45 minute drive from the capital city Thimphu, serves as a halting place for tourists on their ways to Punakha. Tourists relax in this peaceful place and absorb the scenic beauty while sipping Coffee at the Dochula Cafeteria. A spectacular view of the Himalayas can be seen on a clear­sky day. Colourful prayer flags and stupas which are 108 in number make this pass remarkable. The 108 Chortens called Druk Wangyal Chortens were built by the Queen Mother in honour of the Bhutanese Army who led their country to victory in a war of Southern Bhutan in 2003. Each of these stupas have the imprints of Buddha and religious texts inscribed on its surface. Local people also throng to this place to offer their prayers at Druk Wangyal Lhakhang. The festive atmosphere begins on December 13th when Dochula Druk Wangyel takes place here in the premises of this temple.